Someone just worries about looking at a syringe with a needle, another one is suffering from swallowing powders. Tell us when these drug forms appeared and what was their start. Although the effect of snake bites and poisoned arrows has been known since antiquity, the development of the syringe and needle lasted for several centuries. The blood circulation itself was described at the beginning of the 17th century and the first injection into a vein is mentioned around 1650. Sir Christopher Wren used a syringe made from a bladder of animals attached to a goose's waist to apply wine and opium to the vein of the dog. 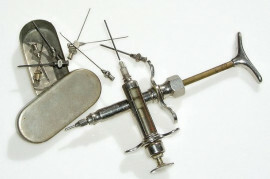 The first injections were injected in Germany shortly thereafter, but mainly because of technological imperfections and risks they were not used until the middle of the 19th century. At that time, the first subcutaneous injection, which patients are currently administering themselves, has also appeared. Her predecessors were not just vaccination lancets. Application of vesicant (blistering agents) is also known to disrupt the skin with subsequent administration of the drug to the exposed skin. Compared to this, the injections of today's application pairs appear to be less painful. These methods were then described by French scientists. They were used around the end of the century, that is, until the injecting of subcutaneous injections in the way we know them today. The combination of glass and metal allowed accurate volume, sharp needles and cannulas to simplify the practice. An important advance that significantly increased safety was the aseptic preparation of injections and sterilization. Development continues today, among the latest trends are micro-needles and monitored drug delivery systems. The first notes about the tablets are found in ancient Egypt - they originated by mixing crushed herbs with dill or honey. The machine for their production, however, was created only in the middle of the 19th century. At this time, tablets also began to be coated with sugar or gelatin for easier swallowing and a more pleasant taste. Today there are many of their shapes and types. It is dissolved in the mouth, known modified-release tablets and those that may contain more active substances. Most recently, we talk about so-called 3D personalized tablets that could be printed on a 3D printer directly for specific patients. This has not always been the case, but today patients with multiple sclerosis have medications in the form of subcutaneous injections and tablets. While injections save the digestive tract, for most people, the most convenient is to take one pill a day; even today, treatment allows.